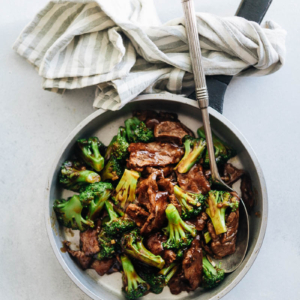 Beef and broccoli is one of those dishes that should be on your fixed weekday dinner menu, because it’s so easy to make, super healthy, and extremely delicious. If you’ve been ordering takeout, I highly encourage you to try making it at home once. You can cook everything in one pan. No extra blanching for the broccoli required! You can use any cut of steak and it will be tender. The dish is extra saucy and goes great with rice. No wok needed! You can use a flat skillet and still get that restaurant-style taste. (1) Crush the garlic with a knife before peeling it. You’ll reduce the peeling time from 30 seconds to 3 seconds per clove. (2) Use a garlic press to skip the cutting and produce extra finely chopped garlic. (3) Instead of boiling a pot of water to blanch the broccoli, use the method in the recipe below to steam the broccoli in the same pan. It’s so much faster and makes one less pan to clean up. (4) Use a large heavy flat skillet instead of a wok. It is especially helpful if you do not have a gas stove at home. The type of authentic Chinese dishes that benefit most from wok cooking is the type that uses minimal seasoning and sauce. For example, vegetable dishes like stir fried choy sum or sauceless dishes like fried rice. When they’re prepared in a wok vs. in a skillet, you can actually taste the difference. 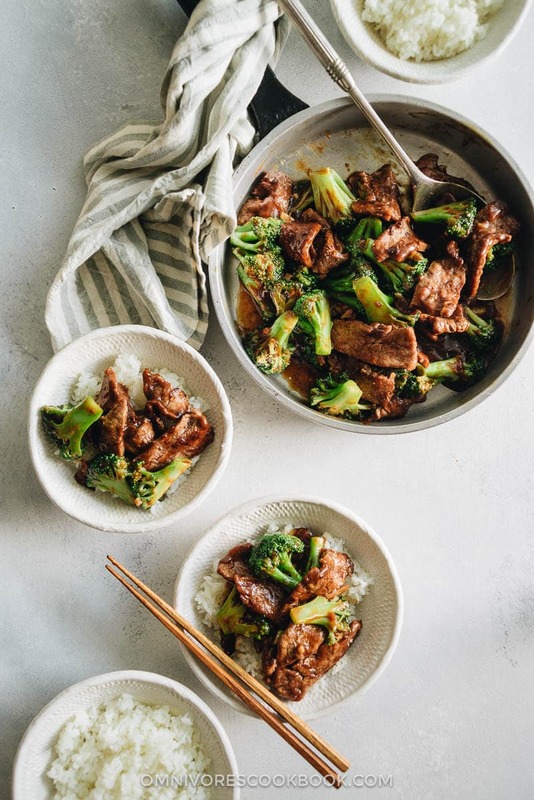 However, dishes like Chinese beef and broccoli use a very flavorful sauce. It makes skillet cooking more tolerable. Plus, in the case of home cooking, you have a less powerful stove and might need to cook the food in more than one batch. So you will benefit from using a skillet on an electric stove because you will have a larger contact surface to sear the food properly. 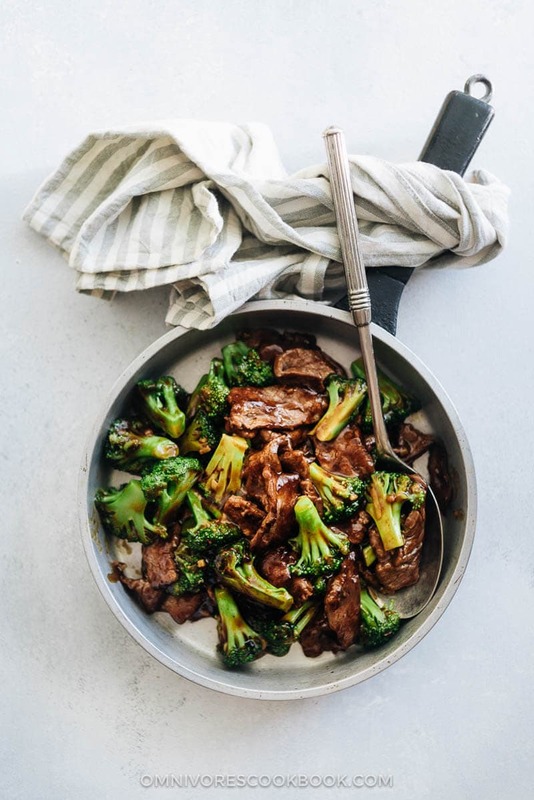 Although you can use almost any nonstick skillet to make takeout-style beef and broccoli, a deeper pan such as the Calphalon nonstick deep pan works best, because you will make less spill when stirring the food. If you do want to use a wok on an electric stove, get one of those with a large bottom that can cover the biggest heating element on your stove. 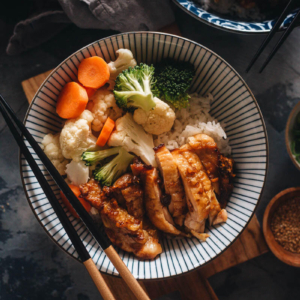 If you like to learn more about Chinese stir fry, check out my cookbook – The Chinese Stir Fry Sauce Cookbook, 9 Sauces, 41 Easy Recipes, And Step-By-Step Guides to Making Restaurant-Style Dishes with Success. 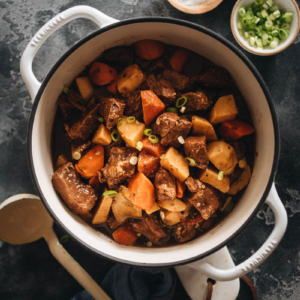 It is a 157-page E-cookbook that guides you through the basic Chinese ingredients, cooking equipment, and stir fry workflow, to help you cook Chinese food like a pro! If you give this recipe a try, let us know! Leave a comment, rate it (once you’ve tried it), and take a picture and tag it @omnivorescookbook on Instagram! I’d love to see what you come up with. 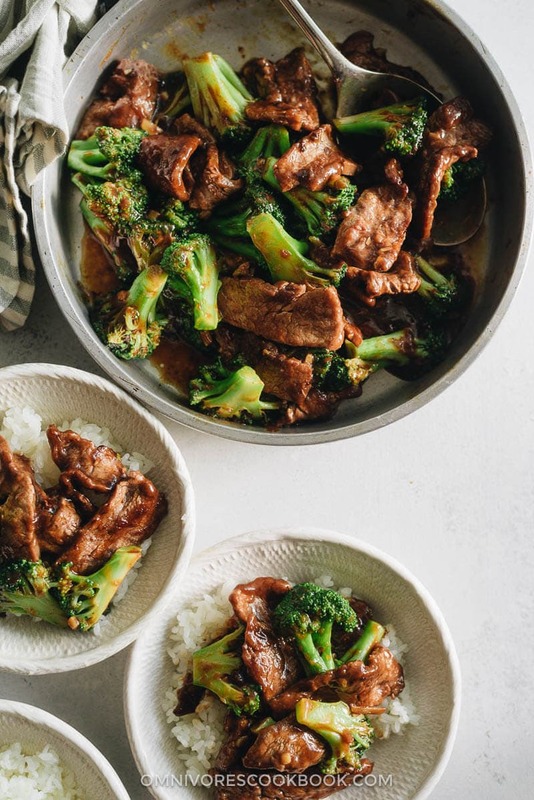 This takeout-style Chinese beef and broccoli dish is extra saucy and quick to prepare. The recipe does not require a wok and you can still get that authentic taste. To convert the dish to gluten free, use tamari instead of soy sauce, and use dry sherry instead of Shaoxing wine. Slice the beef against the grain into 0.5cm (1/4 inch) thick slices or 1-cm (1/2 inch) sticks. Transfer to a small bowl. Add soy sauce, peanut oil, and cornstarch. Gently mix well by hand until all the slices are coated with a thin layer of sauce. Marinate for 10 minutes while preparing the other ingredients. Combine all the ingredients for the sauce in a bowl. Mix well. Add 1/4 cup water into a large nonstick skillet over medium high heat until the water begins to boil. Add the broccoli and cover. Steam until the broccoli just turns tender and the water evaporates, after about 40 to 50 seconds. Transfer broccoli to a plate. Wipe the pan with a paper towel held in a pair of tongs if there’s any water left. Add the oil and swirl to coat the bottom. Spread the steak in a single layer. Allow to cook without touching for 30 seconds, or until the bottom side is browned. Flip to cook the other side for a few seconds. Stir and cook until the surface is lightly charred and the inside is still pink. Add the garlic and ginger. Stir a few times to release the flavor and fragrance. Return the broccoli to the pan. Stir the sauce again to dissolve the cornstarch completely and pour it into the skillet. Cook and stir until the sauce thickens, about 1 minute. Transfer everything to a plate immediately. Serve hot with steamed rice or boiled noodles as a main dish. A well-marbled cut will generate a more tender steak, once cooked, than a lean cut will. I like to use boneless short ribs for stir fry. They are much cheaper than premium steak and have a perfect lean-fat ratio. Dark soy sauce will add an appetizing dark color to the sauce, but you can skip it if you don’t have it. The post was originally published by Nov. 7 2016, and updated by Nov. 3th 2017. Hello there! Your recipes are delicious and created with care, which I can tell. But your nutrition facts.. I don’t know where you get them.. your nutrition facts are waaayyyy off, outrageously misleading. I would highly recommend taking them off your blog altogether. Otherwise, keep up the fabulous recipes! Hi Emily, thanks so much for the feedback on the nutrition facts. 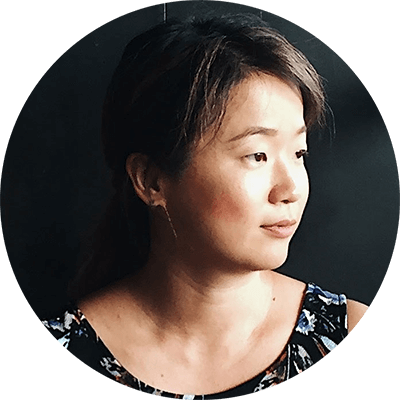 I got it from a free online platform, where they have tons of ingredient nutritional data entered by users. I know it’s not accurate from the beginning, but I had no idea it’s so wrong… I know the sodium level is way off for one thing. I’ll stop publishing that from now. Will clean up the old ones once I get some time. Great recipe…easy and the 1 pan skillet is the way to go. I am a newbie learning to cook Chinese..this made me look like a genius.. I am missing something. 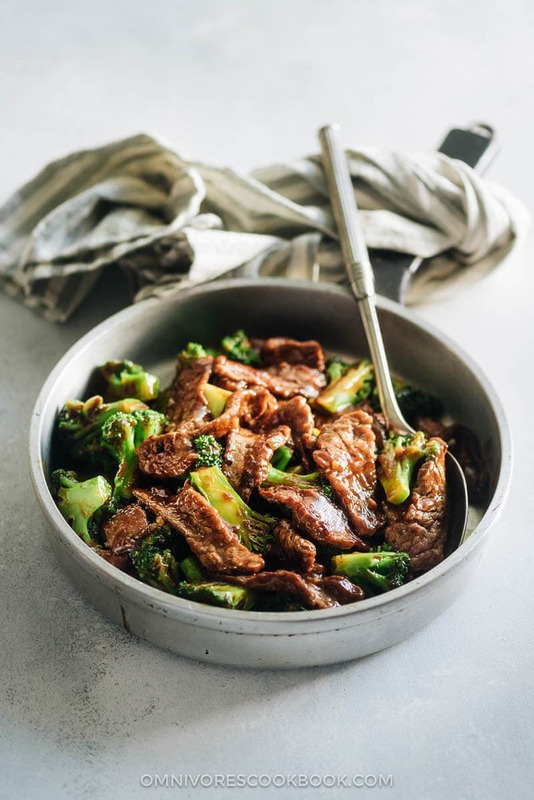 The recipe is labeled “Chinese Beef and Broccoli with Tofu (One Pan Take-Out)” and I am looking specifically for tofu recipes. 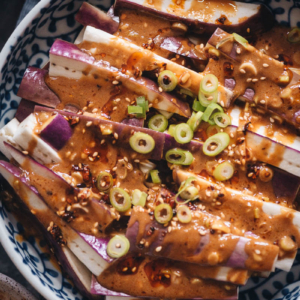 No mention of tofu except in your title. Made this last week and it was so good I’m having it again tonight. Goes together in a snap and clean-up is quick and easy. I did add a hot home grown pepper cause I like spicy. Your marinade says to use vegetable oil but then your instructions for marinading the beef says to use peanut oil…..Which is correct cause those are two different types of oil with different flavor??? Hi Flip, sorry about the confusion. I usually use peanut oil to make my stir fries, and you can replace it with vegetable oil if you don’t have peanut oil. Just updated the recipe. Hi there and thanks for posting all these delicious recipes! I’ve made your hot and sour soup and oh my goodness it is SO good!! 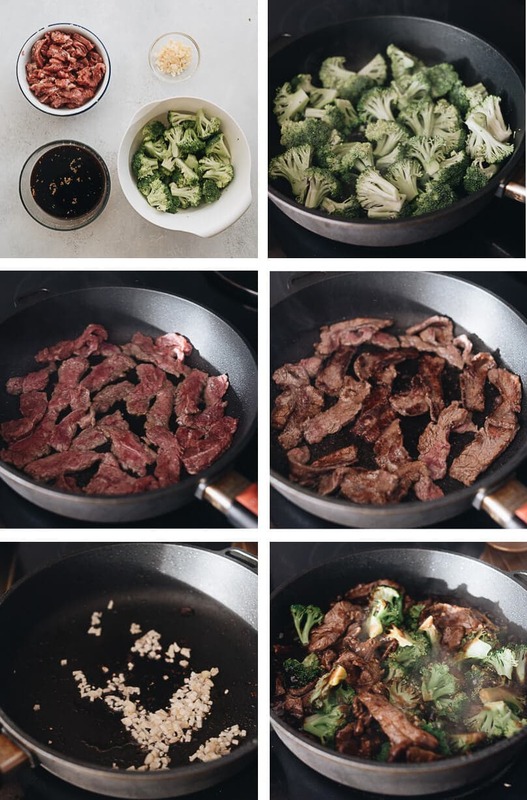 Question about the beef and broccoli recipe. If I use oyster sauce and sesame oil for extra flavour will it taste okay? Yes! Pretty sure they will work in the recipe.